Extraordinary custom built single family home with craftsman style finishes. This extra large new construction home is being developed by Lighthouse Developers and built by Albert G. Juliano Builders. 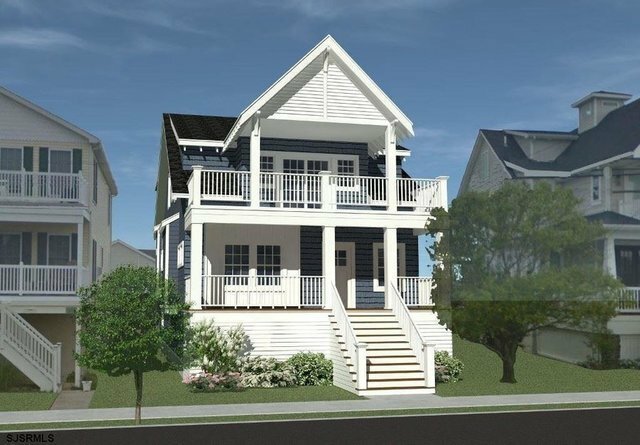 This home will feature 5 large bedrooms and 4.5 bathrooms, 2 car garage, parking for 4 cars, 4 decks, and custom finishes throughout. Enter into this home off of the front porch where you are greeted by a large entry foyer and den, set to the left is a first floor master suite with walk-in closets. The first floor also features a laundry room, half bath and expansive kitchen and family room with access to the rear deck. The second floor features a second master suite with access to the second floor deck. Two addition junior master bedrooms, a guest bedroom, hall bathroom, and a rear deck round out the second floor. The 2 garage features ample storage, two car parking and a ground floor entry foyer. The maintenance free exterior features PVC trim, vinyl siding, vinyl railings and a cabana shower. Don?? ?t let this one of a kind single family home slip away...start making your selections now!